One of the symbols of recently gentrified Peckham is the restored Bussey Building. At the end of a sepulchral warren within a courtyard adorned with modernist and surreal supersized wall art - underneath the tracks of Peckham Rye Train Station - the now renamed venue is home to the CLF Art Cafe. Set over several floors the bar and theatre is reached by ascending the once grimy but now disinfectant-infused stairwells. Despite the rather gritty surroundings, the sparsely furnished bar is surprisingly cosy and warm. D’Angelo’s classic 2000 album Voodoo plays the night this writer visited, and the low-fi, dirty production of that classic suite perfectly fits this environment. It’s the same for 11:11 Productions depiction of Shakespeare’s political thriller Julius Caesar. It is austere; there are no frills at all and even the programme is a scrap of paper. Neither modernised nor updated for a contemporary world, Director Sam Wood, marshals his 11 person cast to focus strictly on this Shakespearean rendition. And the only concession seems to be the male cast wearing Arabic dishdasha robes. It’s better for that though as jealousy, resentment, political intrigue, civil war and conflict infuse the play’s rich dialogue - which enhances the drama. The story is this; Julius Caesar has returned to Rome triumphant from another successful military campaign. The political establishment is prepared to award him even more honours, which breeds resentment among his colleagues who fear his growing authority. Typified by the resentment of co-conspirators Cassius and Brutus - whose festering jealousy goes against the acclaim for the eponymous hero, Caesar’s rivals convince themselves that the Emperor’s elimination is necessary for the good of the republic. Events then inevitably overtake their flawed intentions – to a bloody and murderous denouement – including several suicides and an ISIS-style headchopping scene. Just above floor level on a stage made of industrial palates the violent narrative unfolds at a fast but well-calibrated pace. Luca Romagnoli’s soundscape and lighting has singing and music competing with thunder, rain and lightning - which mirror the maelstrom underway on the compact stage. It was too hot in there though and - at times - I was falling asleep; through either my own somnambulance, the heat or the [only sometimes] soporific nature of a marathon performance which requires concentration – maybe a combination of all three. The mostly consistent performances are committed and enthralling. [But did Caesar stutter and forget his lines after 40 minutes?]. 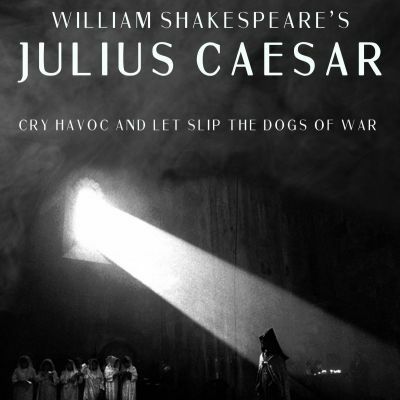 All the now famous phrases are delivered persuasively by performers who own them with lucid and authoritative enunciation: “Beware the Ides of March”, “let slip the dogs of war”, “friends Romans countrymen I did not come to praise Caesar but to bury him”. Towering in height, Matthew Eades stands out as regal and majestic in the title role; as does Vangelis Christodoulou’s conniving Brutus; Adam Elms’ Cassius finds his range and catches the rhythm of the writing quickly; and the strong voice and good diction of a persuasive Matthew Crowley gives Marc Anthony credibility. Although the drama is shot through with political machismo, both Charlotte Gascoyne's Calphyurnia and Jane Walters Portia are powerful. London does not want for Shakespeare productions. In that sense then at over two uninterrupted hours the performance is possibly too long for this venue. All the same, this thorough and muscular edition - despite needing some pruning - is expertly overseen by Best Director Award nominee Samuel Wood, and definitely merits a bigger audience than was present on the night this reviewer attended.